I’ve been on a nearly year-long journey of fighting cancer for a second go round. Stage four breast cancer. I’m in what they call palliative care, but that’s not hospice just yet. My oncologist is firm that they are very different. One can be fighting cancer in palliative care for years, even. (Many days I think I can’t handle the fatigue or nausea one more day, and I want a loving hospice team to scoop me up and kindly carry me into Heaven.) That’s the way to go! People call me brave and courageous; I whimper in my bed and marvel that others see me as strong. Yes, I get up most days, push through the fatigue after a lengthily time praying, singing to myself, and listening to an encouraging talk or Psalms. But this post is about storyropes. And bridges to release trauma. I want to share via video because I’ve slowly read, limped through some excellent training, taken a bit of yoga, tried relaxing, breathing techniques, and still I see the making of a storyrope is a key and profound way to engage, explore and release our stories. So, I am determined to make a storyrope demo video as soon as I have the strength, with the hope that the teaching can be translated into several languages as I teach. A friend from Hong Kong is coming mid-september, she has taught storyropes there, and I hope she can help make the video. We all tend to carry shame and hide it. Many have had shameful things done to them. Many have done shameful things they fear ever exposing. Our bodies and brains store our shame, our trauma, our losses and abuses. The shame, trauma, etc, can be released through: art, music, drama, movement, poetry, yoga. Secondary “talk therapy” may be helpful once bridges have been built with the creative arts. Example: A formerly trafficked woman may see a tree in misty shadows and begin to cry. The art tapped into her deep sorrow at walking the streets, and now, she began putting words to what she was feeling upon seeing the misty tree that looked like she felt. 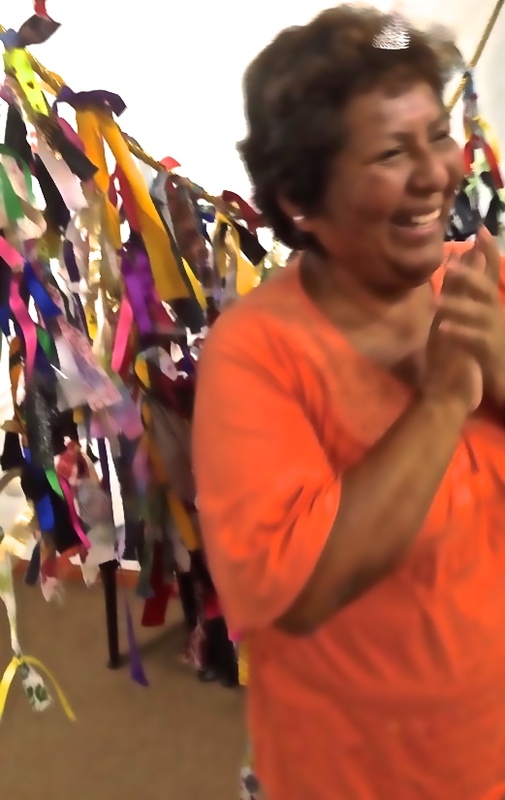 The storyrope making is a kinesthetic activity. Movement is good for releasing trauma. 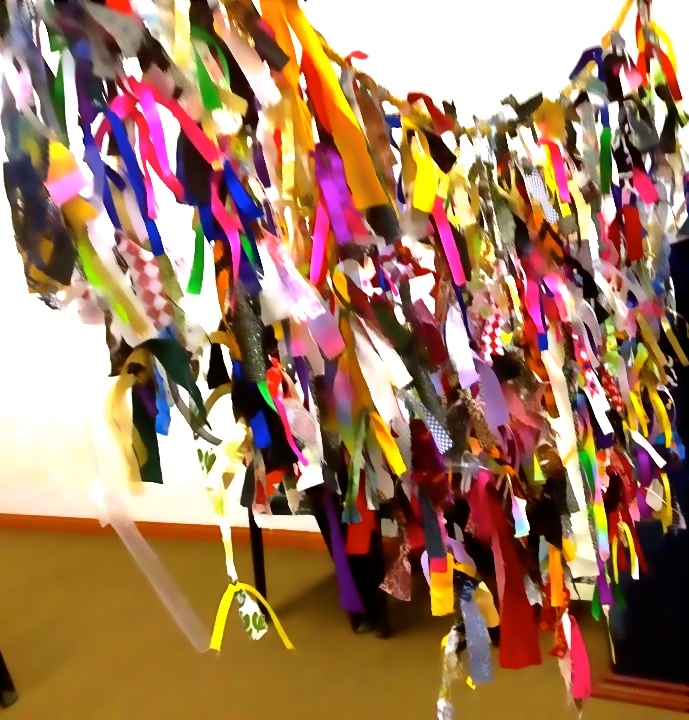 and it is coupled with “telling” our stories through colors of fabric and ribbons that represent parts of our stories. Once words are found for the strips of fabric and ribbon, shame begins to be released from our minds, emotions, bodies and souls. I like to care for someone who shares their story with the storyrope by asking if they would like prayer – to speak truth and life into dark and evil, shameful situations. Quiet listening and grieving with the person sharing their storyrope in best. Reading some Psalms may be helpful in soothing wounded places. African friends would often sing in community after each woman shared their story. If participants want, in prayer, they may release their trauma to a just God who loves them. I’m respectful of all participants; we are each in different places in our spiritual journey. We never want to add trauma by pushing people to share something they are not ready to share this time. They may share with a counselor, women’s leader, pastor, rabbi, priest or a family member with whom they really feel safe. The video below was made last year, and it just tells a bit of how to get started with making storyropes. I hope to expand this video into a teaching video in the days ahead, Lord willing. Thanks for joining me on this journey, and thanks for your many prayers. Our God hears! We just have to relax into His sovereign love, that is shown by Jesus. 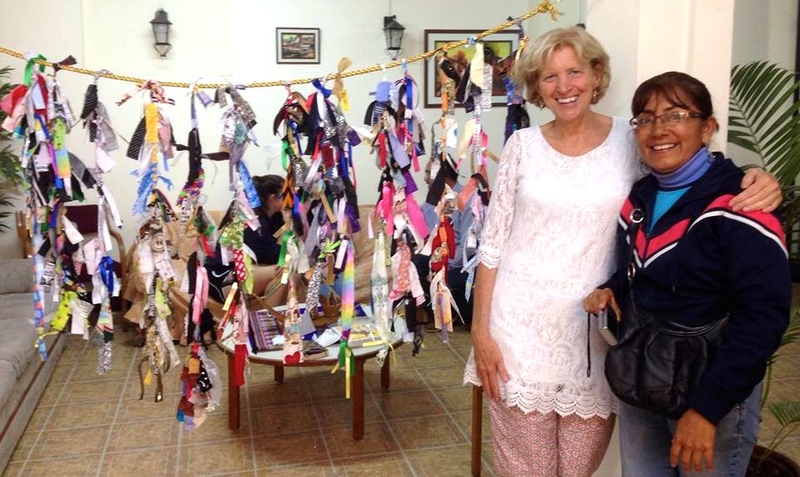 Storyropes in Peru – A woman set free that night! We began our time of storying, by having both the American team and the Peruvian leaders make storyropes™ and pray through their stories. This entailed two workshops. We eventually put all our storyropes™ together on a gold chord. The gold chord represents God’s overarching story. We are part of God’s larger story of redemption. One from the American team is tying on her storyrope™. Her story matters, and is important for telling God’s story. Without her story, God’s story is incomplete. This dear woman came forward with her storyrope™ completely overcome with sorrow. She asked for help from Konnie to share her story. I saw her meeting with Konnie one on one, and eventually she joined a small group of women, where she shared her difficult story. She eventually did tell her story, released deep trauma, and asked Jesus to save her from sin and death. 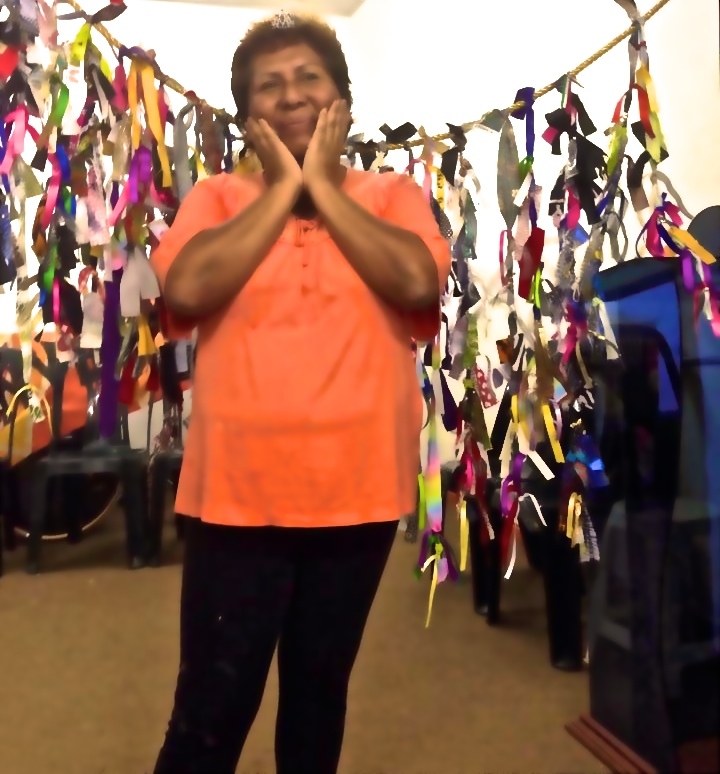 What joy was expressed when she hung her storyrope™ on the gold chord that represents God’s story! We were all rejoicing with her! God sets the captives free. Bring light and life(Jesus) into our stories, and evil slinks, scurries away! 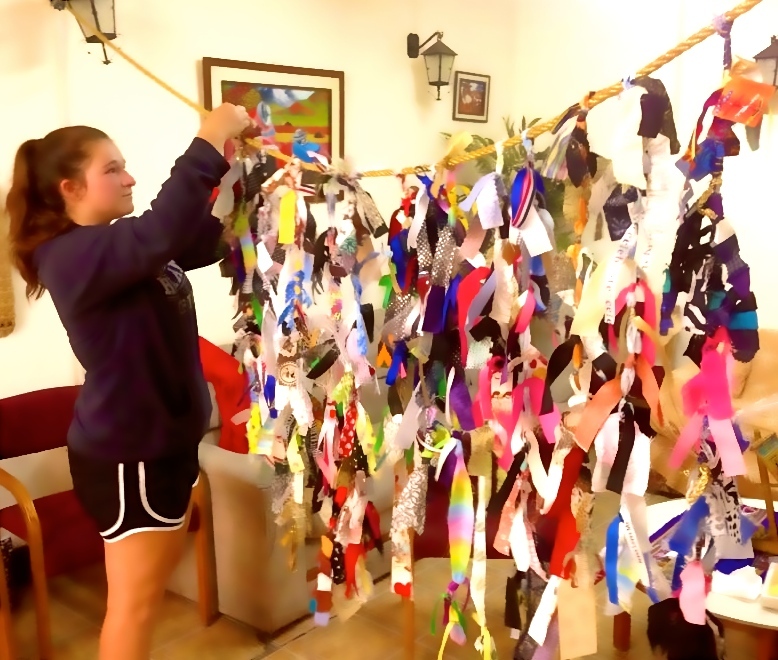 After tying their storyropes™ to the gold chord, each woman received a crown to remind her of her worth and significance as a woman and daughter of the King of Kings. Many have been abused, violated, enslaved, beaten, and abandoned by the most important people in their lives. They began to see their true selves and embrace their stories. 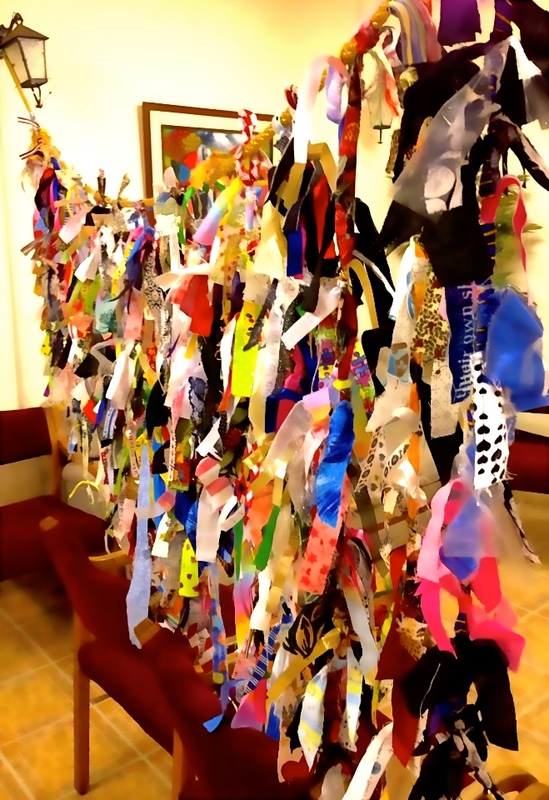 As we looked at the tapestry our storyropes™ made, it helped us to remember we are not alone, and we matter for the telling of God’s beautiful, larger story. The telling of the darks and lights are important in creating this beauty. A wall of storyropes™ with the Peruvian leader, Eisleen. I have just returned from a three week trip to Trujillo, Peru. What an amazing adventure! 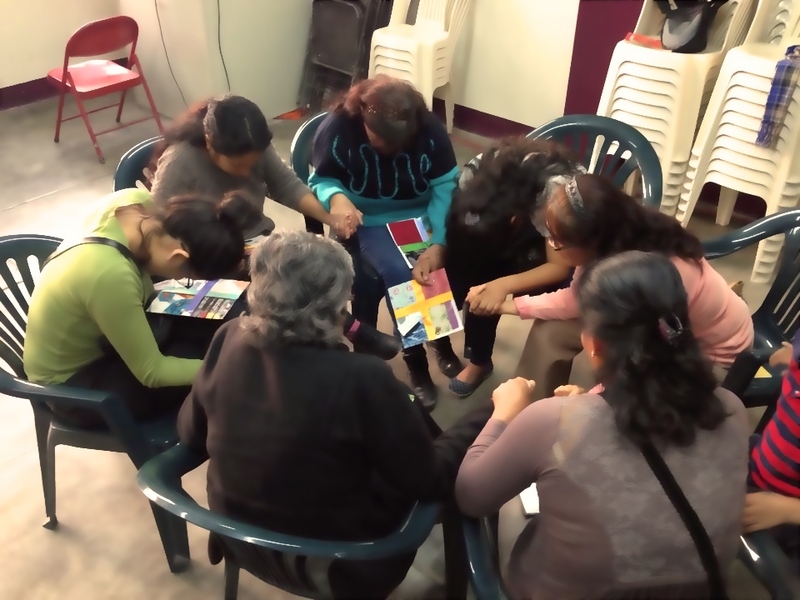 A team of 16 women served in seven women’s oasis centers using storyropes™ and story squares to help share personal stories. I always began our time together with a Bible teaching that emphasized Jesus’ love for women. I used my collaged art books to teach the Bible stories. Along with my American team, I was hoping to give each woman emotional courage through the Bible stories, so they could share their hearts, their stories, and release deep trauma. Marcia Carole teaching the “Woman At The Well” story. We prayed for each woman. 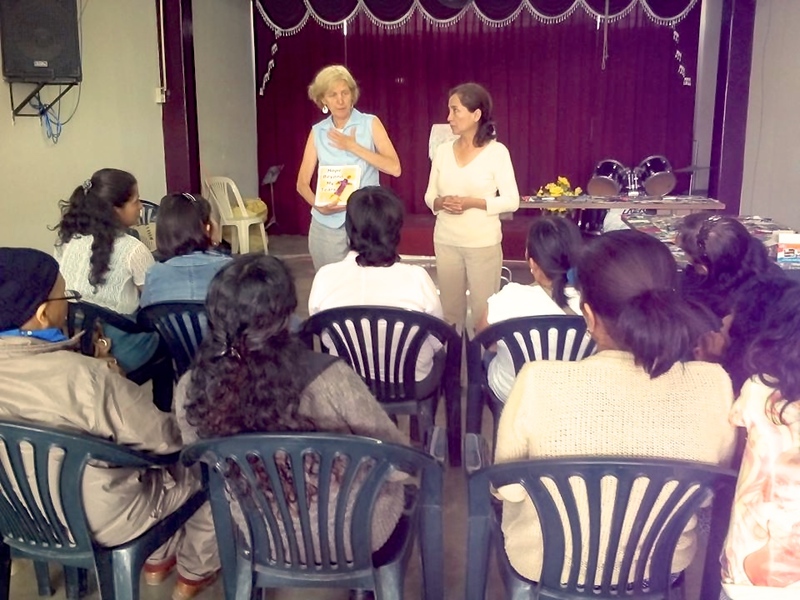 The American and Peruvian leaders divided up into small groups in order to hear everyone’s story; those who felt comfortable sharing what they could, expressed relief and healing. 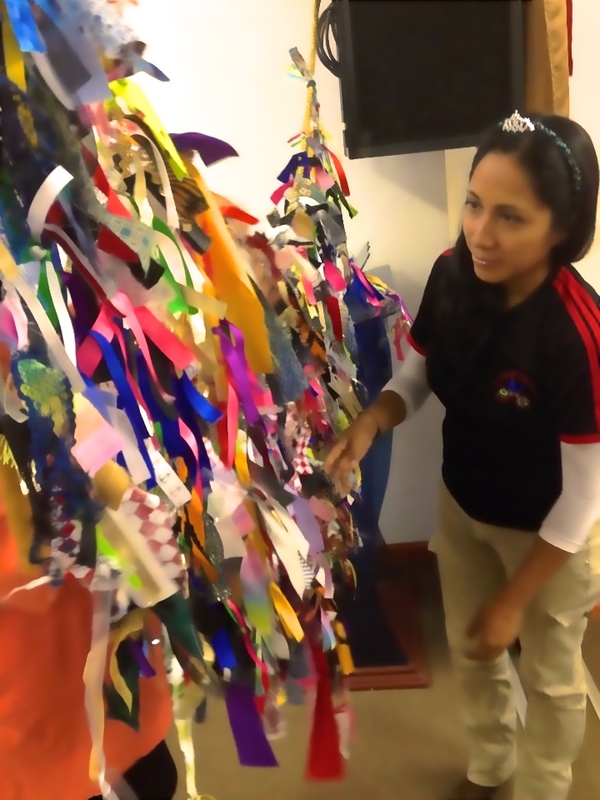 It was especially meaningful when the Peruvian women prayed for the American women. 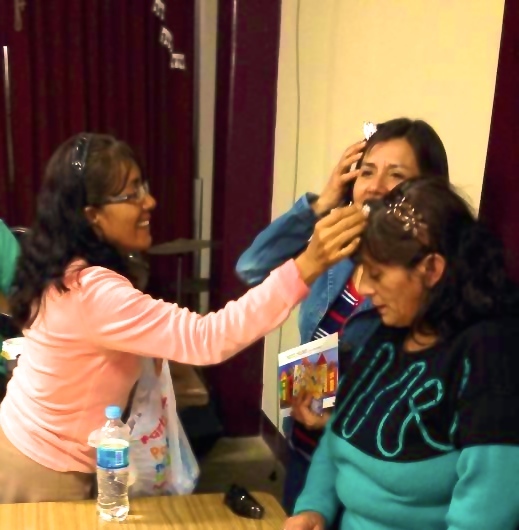 After praying, Each woman was given a crown to remind them they are daughters of the King of Kings! We then shared a simple meal together. 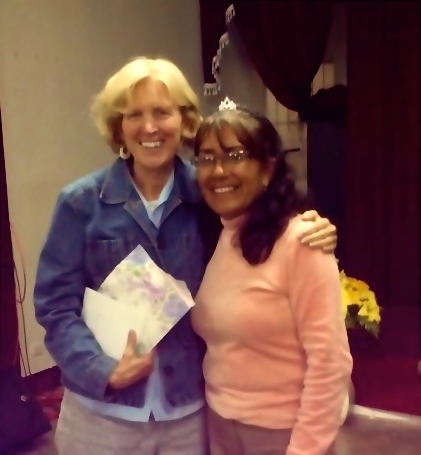 After many workshops, I felt so blessed and honored to know this dear new friend in Peru. I’ll be sharing more detailed stories soon, but I wanted to share a first look at my time in Peru. Stay tuned for more!